If you were to shift it to post JW Isla Nublar, I'd gladly join in, since I'm not as familiar with Sorna than I am with Nublar, so I would find it too hard if it were set post JP 3 Isla Sorna. I can even bring in the character from JPL that I signed up with for that Jurassic World: The Experience RPG that was started not that long ago. We can play as a human character, can we not? If not, I could try RPing as a dinosaur, since one of the fan fics I'm thinking of is set after JW from Blue's point of view (still undecided as whether to go through with this fan fic, I'm still thinking about it). If we do have it post JW, the setting should be a good few years after the park is abandoned to allow life to recover and boost numbers of the animals people will want to play as. Supposedly there is only one rex and one/two surviving raptors on the island (unless there are others hidden on the island, maybe); too few to create a viable number of animals, especially considering raptors and rexes are among the most popular RP species. Asexual reproduction - whereby a single female lays eggs without the involvement of a male. The resulting offspring are clones of the mother. This method of reproduction - parthenogenesis - has been observed in amphibians, komodo dragons and other lizards, which largely take up the DNA of the dinosaurs. If the dinosaurs from the original Jurassic Park could change gender owing to amphibian DNA, then surely this is also a possibility. It is highly likely that live eggs of multiple species were stored in the abandoned laboratories for future use in the park. These hatched and created a first generation of "wild born" dinosaurs on the island. Without human intervention, nature takes course and the dinosaurs begin to breed of their own accord. Along with that, another idea is that some of the JW population intermingles with the pre-existing JP population and inter-breed with them, in addition to your ideas (which I really like). Considering JP The Game is also canon to this? What, that the island was supposedly bombed? I thought in the end Gerry, Jess and Nima called it off? Maybe I need to replay it. :? I never played it, so... xD unless the park was built after the bombing. EDIT Scratch that, nah. Stupid idea, how could the Visitors Centre have survived? If I recall they ended up calling it off before they reached Nublar, so there's no worry on that end. I think Nublar got nuked. From Park Pedia (who I am only using in the absence of JPE). It is unknown whether or not the island was napalmed. Dialogue from Jurassic Park: The Game suggests that it was intended to be and dialogue from the deleted scene from The Lost World: Jurassic Park agrees with this, however the T. rex in Jurassic World has been confirmed to be the same one from the original film. 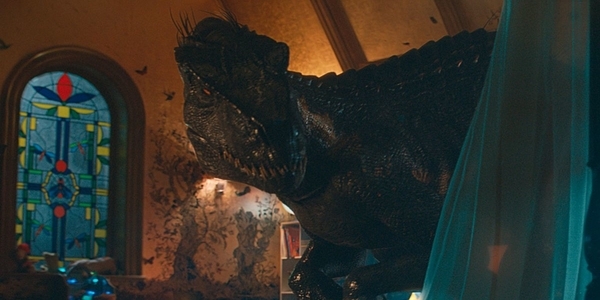 I think for the sake of the RPG let's say that InGen only demolished the paddocks and left the Marine Facility, Visitors Center and other "human compounds" open in the event they return to rebuilt the park (Jurassic World), as well as killed a partial amount of the dinosaur population (not all, of course, to save money). Afterward, Billy calls the military himself, reaching Haskell. He tells Haskell to proceed with the attack and he is told that will happen in 90 minutes. However, it apparently never occurred as the forests of Isla Nublar show no sign of deforestation, Rexy, Jurassic Park's Tyrannosaurus rex, lived for years on the island after the Isla Nublar Incident of 1993, and there are many remnants of Jurassic Park that remain and no sign of being charred. Okay, fair enough. My intentions weren't to hinder anyone, just to keep things real. Totally cool, man! Just tried to clarify things, because with the type of history this setting has things could get complicated, so we always need an excuse. At this point in time I don't think Jurassic Park: The Game should really be considered canon. Also, if anyone has the Live the Legend (NOT Return to New Lands) field guides, I'd love to look at them. I find them to be very good sources just for information on the dinosaurs of Jurassic Park in general, rather than just a guideline for the RPG.